Today's global organizations depend on being able to unlock business insights from massive volumes of data. Now, with IBM® FlashSystem 900 Model AE3 that is powered by IBM FlashCore® technology, they can make faster decisions that are based on real-time insights. They also can unleash the power of the most demanding applications, including online transaction processing (OLTP) and analytics databases, virtual desktop infrastructures (VDIs), technical computing applications, and cloud environments. 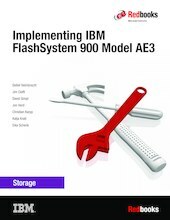 This IBM Redbooks® publication introduces clients to the IBM FlashSystem® 900 Model AE3. It provides in-depth knowledge of the product architecture, software and hardware, implementation, and hints and tips. Also presented are use cases that show real-world solutions for tiering, flash-only, and preferred-read. Examples of the benefits that are gained by integrating the FlashSystem storage into business environments also are described. This book is intended for pre-sales and post-sales technical support professionals and storage administrators, and anyone who wants to understand how to implement this new and exciting technology.